Do not hesitate to arrange an appointment! 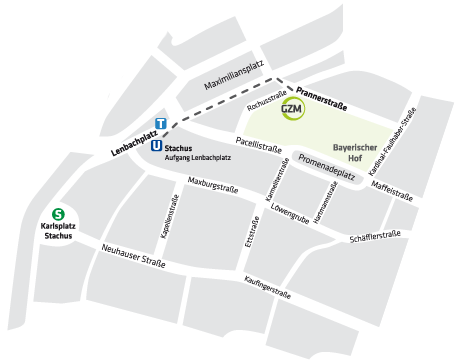 You find our Health Centre in “Prannerstraße” street next to the crossroads at “Maximiliansplatz” square – “Karlsplatz/Stachus” underground and urban railway station, “Lenbachplatz” exit – “Lenbachplatz” tramway stop (line 19). If you travel by car, we recommend you park your vehicle in “Salvatorplatz” underground car park. Generally, there are, however, parking spaces available in the area of “Maximiliansplatz” square.